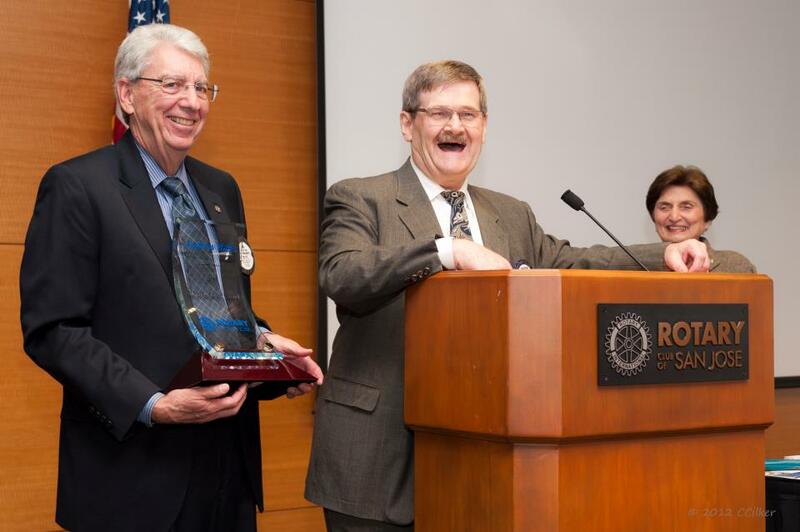 Andrew Bales walked right into a surprise Wednesday, as the Rotary Club of San Jose presented him with its 24th Don Goldeen Award, presented annually to individuals who have made a significant impact on downtown San Jose. Bales, the president of Symphony Silicon Valley, thought he was attending Wednesday’s meeting to support a friend, whom he was told was getting the award. “I am truly speechless because I was here to give it to a more deserving soul, but now I’m mad at him,” joked Bales, who’s certainly deserving himself. Bales was president of the Cleveland Ballet and helped forge the partnership that paved the way for today’s Ballet San Jose. He also stepped in to revive the city’s orchestra after the San Jose Symphony collapsed more than a decade a go. The award is named for the late Don Goldeen, who was a longtime furniture store owner downtown. Previous recipients include Steve Wozniak, Tom McEnery, Irene Dalis and Mayor Chuck Reed, who was similarly surprised by the award in December 2010.
it was just announced today. I’ll have it in my column for Friday, which should be online tomorrow. Still nothing up at the Merc, but I’ll keep checking. *Ashlyn, voiced by Ashleigh Ball, is the oldest sister. She is practical, calm and knowledgeable. She loves music, especially playing the flute and oboe. She is straightforward and cares for her sisters, for whom she tries to act as a role model. Her flower is the purple geranium and her gemstone is a garnet. She bears the most resemblance to her mother Queen Isabella. I’d suggest everyone take the F train, but this event already happened (December 21, 2011). Make Music NY Winter (2011): The Thru Line (F-Subway) from Streetfilms on Vimeo. I love your site and was thrilled to hear of your “win” against PayPal. I recently had a heartbreaking experience of my own with them. Both Cats prefer the oboe to bagpipes. Winslow, in fact, is fascinated by it. But then she is also an addict: Catnip. Someone should really bring back the oboe in pop music. Ah, the Eighties. I do not doubt that it can. Lt Col Ron Capps has no doubt that writing about his wartime experiences saved his life – and now he has the chance to help provide the scientific proof. Over 25 years in the army and a career in the foreign service, he witnessed five different wars. He served in Rwanda, Kosovo and Afghanistan, where he was treated for post traumatic stress disorder. He went to Iraq, and later in Darfur, Sudan, he attempted suicide. “My medications weren’t working and I was self-medicating with whatever I could find lying around,” he says. Now Lt Col Capps is running creative writing workshops at the National Intrepid Center of Excellence (NICoE), a new military medical facility at Walter Reed National Military Medical Center in Bethesda, Maryland, that offers holistic healing for brain trauma and other invisible wounds of war. And for the first time, neurologists there will attempt to discover how creative writing and other arts therapies physically affect the brain. “We have in this facility the technology to look in great detail at the anatomy of the brain and the function of the brain,” says NICoE Director Dr James Kelly. Dr Kelly’s team is now creating a series of tests to monitor the brain’s metabolism and magnetic impulses as patients are exposed to writing, painting and music. Do note that it’s about the participation in the arts rather than the observation (although I’m sure going to a concert or a gallery can also provide healing moments) they are talking about.